Have you ever wished that your over-the-range microwave oven/hood did a better job drawing out steam and smoke? Well, your wish has been granted. 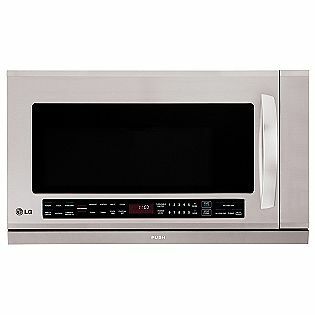 LG's got a great microhood that will make short work of your cooking fumes. It's the LMHM2017S*. It's available in white (LMHM2017SW), black (LMHM2017SB), and stainless steel (LMHM2017ST). The LMHM2017S* microhood follows LG's sharp-edged rectangular design on the outside, with the same tapered handles as their other kitchen appliances. The controls are at the bottom rather than on the side, which gives it a more modern appearance, and allows for more interior space. The interior is pretty standard: white painted steel with a carousel and a wire rack for warming two dishes at the same time. And, at 1100 Watts, it's got enough juice to take care of all your microwave needs. There are two things that really set this microhood apart, though. First, there's a warming lamp inside to keep food warm rather than re-microwaving it. That means that food won't get tougher or lose its texture as it waits to be eaten. The radiant heat lamp works better than a hot bulb or microwaving, maintaining temperature but without drying food out. The second thing that makes this microhood special is its Extenda Vent. The vent actually extends forward to cover the whole cooking area. Unlike most other microhoods, even the front burners will have complete coverage by the hood. And, with a 400 CFM fan, there's more than enough suction to take care of all the steam and smoke your cooktop can dish out. If you want to keep the air in your kitchen clean while you cook and want the convenience of an over-the-range microwave, the LG LJHM2017S* microhood just might be the one for you.